EDGE OF HEAVEN is a political, espionage and military thriller, written in the style of Tom Clancy and Stephen Ambrose. Published in 2009, "Edge" describes the rise of an American "Security State" with one party rule beginning with a GOP rout in 2016(a nationalist like Ted Cruz is the President). Edge of Heaven describes the "hardening" of the US/Mexican border and corresponding legalization of drugs in America to establish a permanent (American) underclass of labor that is monitored in their drug intake. Everywhere, a corporate "Little Sister" surveilance society grows. Social media controls the "Hand-damned" mobile users who drive and text... and don't think any more as analog humans. The fascist President Palmer "speaks for Real Americans" and virtual mob rule creates a "Fortress America" as the bankrupted global military empire collapses under $20 trillion in unredeemable national debt. As the 2020 re-election of a fascist American one party rule is about to occur, a combined Russian and Chinese-launched nuclear/ environmental apocalypse is planned. There has been a months-long leap in global warming that is caused by an atmospheric flood of methane: released from previously frozen Arctic permafrost. Millions of people are starving in Asia and nations like Bangladesh are the hardest hit. America's banker, China, then forecloses on the massive US treasury debt China holds, causing global market collapse. Russia's kleptocratic and imperialist Russian government joins China in coordinated action against America and the West, after "contain America" actions were successful in Ukraine, the South China Sea and Middle East. In Wyoming, the nuclear targeting of the Yellowstone super volcano is done by a Chinese PLA geologist spy, embedded at the University of Wyoming in Laramie. China attacks the volcano with 10 thermonuclear ground-burst warheads... and unleashes the Earth spirit Gaia in a gigaton blast. The American middle west is covered in ash, as global cooling causes crop failures for years. Worldwide, a half billion people are "culled". Another 1.5 billion people will die from civil war and national-level food riots, worldwide. 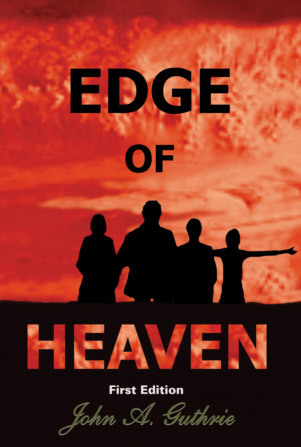 EDGE OF HEAVEN tracks two married couples and their families, as they evolve from the analog 20th Century into the digitally-discreet 21st...and after death into the quantum foam of infinite future possibilities for the basic goodness of human consciousness. The author's DNA becomes the basis for a follow-on book, set 200 years in the future...after the "Era of Survivors." The author's DNA is used to reincarnate him (as an analog curiosity) by Martian colony quantum priests who communicate with the dead. The author becomes a "proof of concept" for the Cult of the Butterfly Wing, the rise of SexTars and Club Wormhole! Here is a Playmate, living in that futureShe loves her new body! Thank you for your interest in Edge of Heaven! More details in this 2010 brochure! Copyright, 2000-2010, John Guthrie, president of Laser Radio, Inc.